The World Champion Giants will return a very similar roster to last season, but they aren't the best team in their division. Honestly, they weren't last season either. Pablo Sandoval has wandered to greener pastures. He's replaced, inadequately, by Casey McGehee. The team also hired outfielder Nori Aoki. Otherwise, you'll find a lot of familiar faces. The pitching staff has plenty of depth, but the lineup remains thin. There is very little meat for fantasy owners. Player values are slightly distorted by the influence of AT&T Park. The most pitcher friendly stadium in baseball is a huge aid to pitchers. By extension, hitter power is heavily penalized. Bumgarner singlehandedly dragged the Giants to postseason glory. Fantasy owners have to wonder if the experience took a toll. Including the playoffs, he threw 270 innings. He's endured a huge workload throughout his young career (he's just 25). Some pitchers like Justin Verlander and Felix Hernandez can eat innings for years without showing ill effects. Most start to breakdown over time. When he's right, Bumgarner carves up hitters with a 92 mph fastball, cutter, and curve. The southpaw throws from a deceptive, near-sidearm angle. Last season was arguably his best, with 9.07 K/9, 1.78 BB/9, and a 2.98 ERA. Unlike most elite pitchers, his shallow repertoire could affect his longevity. He's the seventh pitcher off the board, but I prefer Corey Kluber, Johnny Cueto, and Jon Lester. Cain was a fantasy staple for years. His 2014 ended with injury – a bone spur that required surgery. He's struggled for two straight seasons and always relied upon weak contact to supply value. He's a reasonable rebound candidate at pick 241. I prefer aiming for players with upside like Drew Hutchison or Brandon McCarthy. Even at his best, Cain never offered any strikeout value. Hudson and Peavy profile similarly to Cain at a fraction of the price. Available much later in the draft, they're both reliable veterans. Hudson's low strikeout rate limits him to a waiver wire role for fantasy owners. Peavy is very similar to Cain except he's better at limiting walks. Baseball cares not for your reputation. Of the three back-of-the-rotation options, Tim Lincecum might be the worst. The former ace is still capable of flummoxing opponents. However, his stuff has declined in recent seasons so he has trouble overcoming shaky command. Ryan Vogelsong and Yusmeiro Petit are modestly useful as fantasy spot starters. In many ways Casilla is a perfectly adequate closer. For fantasy owners, he's also one of the worst in baseball. His sinker heavy approach leads to a low strikeout rate. He keeps hitters off balance with a five pitch repertoire, although he rarely uses his changeup. Of the others, his fastball, sinker, and curve are plus while his slider is average. He's prone to occasional rough patches when he loses his touch. That could open the door for Romo. The two relievers traded the closer role last season, and it wasn't the first time. Romo is a slider specialist. He throws the pitch over 50 percent of the time. His 89 mph fastball is decidedly below average, but he stays away from using it. His other secondary pitches include a sinker and changeup. Other names to watch include Hunter Strickland and Petit. Strickland matches the description of a typical relief ace – big heat and a wipeout slider. You may recall his postseason struggles. Petit relies on deception, but it plays up in a relief role. The relief version of Petit held opponents to a .177/.226/.246 line in 49 innings last season. The Giants possessed a league average offense last season, and the current unit should perform similarly. As with many clubs, injuries are straining the depth. Pence will miss about a month of the season. Fortunately, the Giants own one of the best fourth outfielders in baseball in Gregor Blanco. 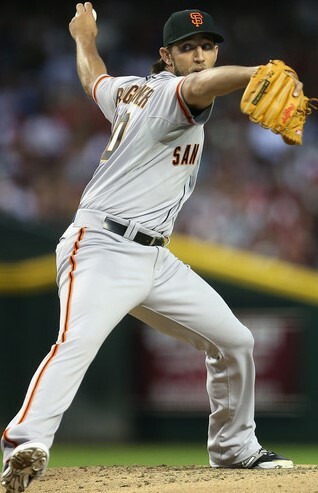 However, he was expected to share time with oft-injured Angel Pagan and platoon-prone Aoki. One plausible solution to the outfield depth is Brandon Belt. Don't expect to see him out there often. The idea has been bandied about to get Buster Posey, prospect Andrew Susac, and Belt into the same lineup. Belt looked to be on the verge of a power breakout last season. He popped 12 home runs in 235 plate appearances. The boost in power came with an increase in whiff rate. His BABIP also plunged over 60 points, which led to a disappointing .243/.306/.449 slash. Projection systems expect something like a .260/.340/.445 line. He's the 18th first baseman off the board, which gives him some upside. Of course, Posey is the Giants' big gun. He's the top catcher on most draft boards, especially in leagues where Carlos Santana isn't eligible. So long as he stays healthy, he's a safe bet to contribute to four categories. For a long stretch last year, he left his owners underwhelmed. He turned things around to post his second best season. Posey is pricey. For those in shallow, one catcher leagues, I recommend targeting somebody like Michael Brantley, Hanley Ramirez, or Yasiel Puig. In deeper two catcher leagues, Posey can be well worth the early investment. The position thins out considerably after the 20th name. Aoki and Pagan are available around the 300th pick. Bruce Bochy has said he plans to bat Aoki leadoff and Pagan third, although he hasn't firmly committed to that alignment. Aoki has strong on base skills, which should allow him to contribute to three categories. He has no power and little scope for RBI production. Pagan's a strange three-hole hitter in that he also has very little power. Nonetheless, hitting ahead of Posey and Belt could allow Pagan to contribute to four categories. Despite a long injury history, he's worth the risk of a late-round flier. Once Pence returns to action, expect Pagan to move up to the two-hole or down behind the other big bats. The defending World Champion Giants are the 12th team in our power rankings. The home ballpark distorts values; making it easier to roster pitchers and harder to scrape value out of their hitters. The lineup offers some value picks, but there are also some non-factors like McGehee. The rotation and lineup are fronted by two elite players, but the opportunity cost to acquire them might be too high.